I have to admit that I have a huge sweet tooth! I love desserts of all flavors and types, and feel that no dinner meal is complete without a dessert. But when the summer heat hits and temperatures are uncomfortably high, I like to try to stick to meals and desserts that are light and delicious. 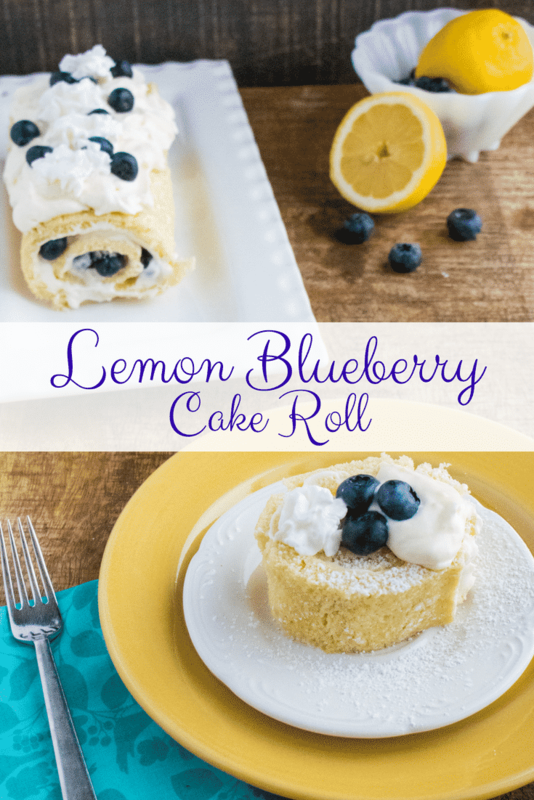 This Lemon Blueberry Cake Roll is the perfect light and flavorful dessert. 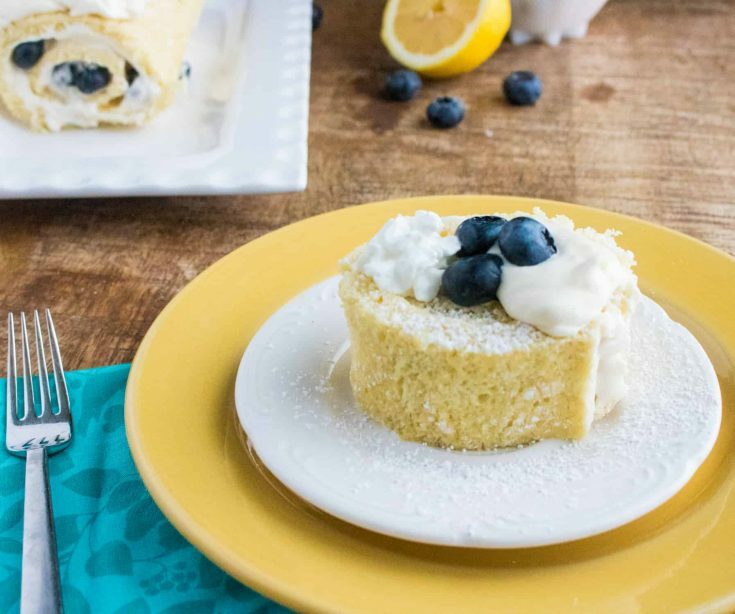 A moist and spongy cake rolled around a thick, creamy, lemon filling with sprinkles of fresh blueberries hits all the right flavor notes! 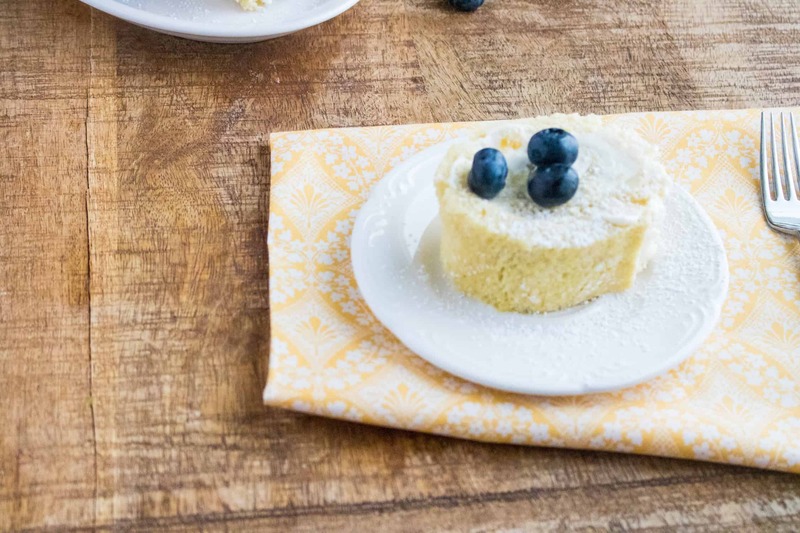 The filling has just the right amount of tang from the lemon curd without being overwhelming or sour, and pairs perfectly with the light vanilla cake flavor. Is a Cake Roll the Same as a Swiss Roll? Referring to a dessert that is composed of a sponge cake rolled around a jelly or cream filling, the names for this dessert are sometimes used interchangeably. 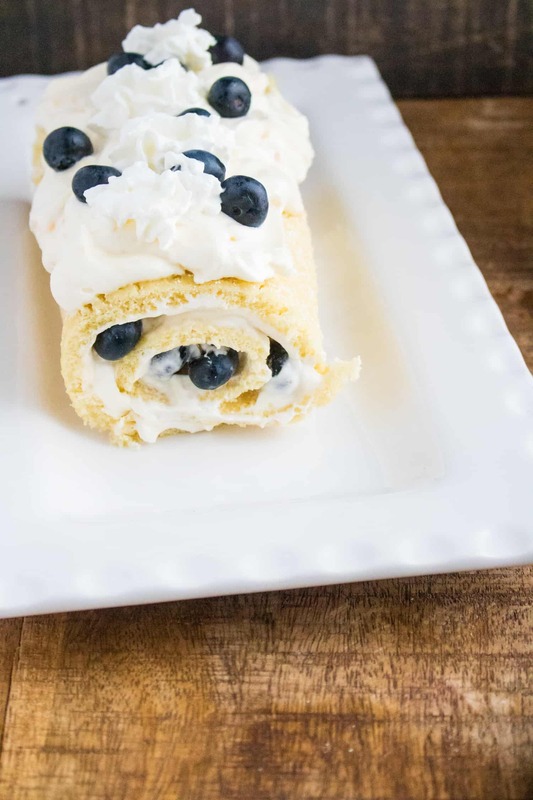 Some common terms you will hear are cake roll, jelly roll, Swiss roll or a roulade, which comes from the French word rouler, meaning “to roll”. The only true difference between these desserts is how they are made. Swiss rolls are typically made with a thicker cake layer, while the roulade is made with whipped egg whites to produce a spongier and lighter cake. Lemon Curd is similar to preserves but has a creamy, much thicker consistency, and it is made with lemons, butter, eggs and sugar. If you can’t find pre-made lemon curd at your local grocery store, you can order it online or, make your own. All it takes is 5 ingredients and 15 minutes! To make lemon curd, you need these 5 simple ingredients: egg yolks, fresh lemons, sugar, salt, butter, and a double boiler. You can create your own version of a double boiler by placing a heatproof bowl or small pot on top of a larger pot, making sure the top pot does not touch the simmering water. Fill the bottom pot of your double boiler with 1-2 inches of water. Bring to boil, then reduce heat and keep at a simmer. Place all ingredients except for the butter into the top pot of the double boiler. Whisk until completely blended, then continue to whisk as the curd cooks. Constant whisking prevents the egg yolks from curdling. Whisk and cook until the mixture becomes thick, resembling the texture of hollandaise sauce, about 10 minutes. If your curd isn’t thickening fast enough, gently turn up the heat and constantly whisk. Remove from heat. Cut the butter into 6 separate pieces and stir into the curd one at a time. Pour curd into a jar or bowl and place a piece of plastic wrap directly on top so it is touching the top of the curd to prevent a skin from forming on top. The curd will continue to thicken as it cools. Step #1: Preheat oven to 375 F. Line a jellyroll pan with buttered foil or parchment paper. Step #7: Whip heavy whipping cream on high in a stand mixer until cream is thick. 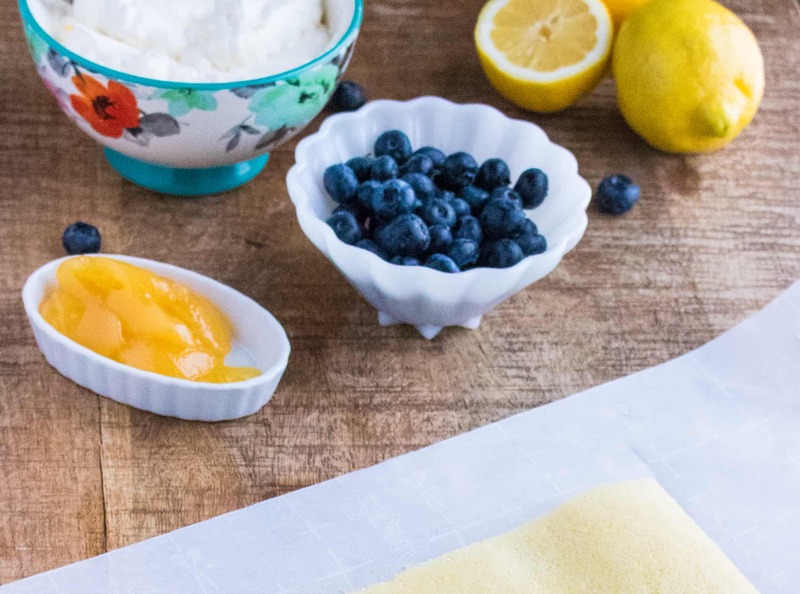 Fold in powdered sugar and lemon curd until well combined. Step #8: Unroll cake and spread the lemon cream filling over the cake. Add blueberries over the top of the filling. Step #9: Tightly roll the cake back up and refrigerate for an hour before serving. Step #10: Sift powdered sugar over the top of the cake to garnish. Add blueberries to the top if desired. Step #11: To slice, run hot water over a knife and wipe dry before slicing straight through. Rinse in hot water and dry knife in between cutting each slice. This allows for a cleaner slice. Preheat oven to 375 F. Line a jellyroll pan with buttered foil or parchment paper. Whip heavy whipping cream on high in a stand mixer until cream is thick. 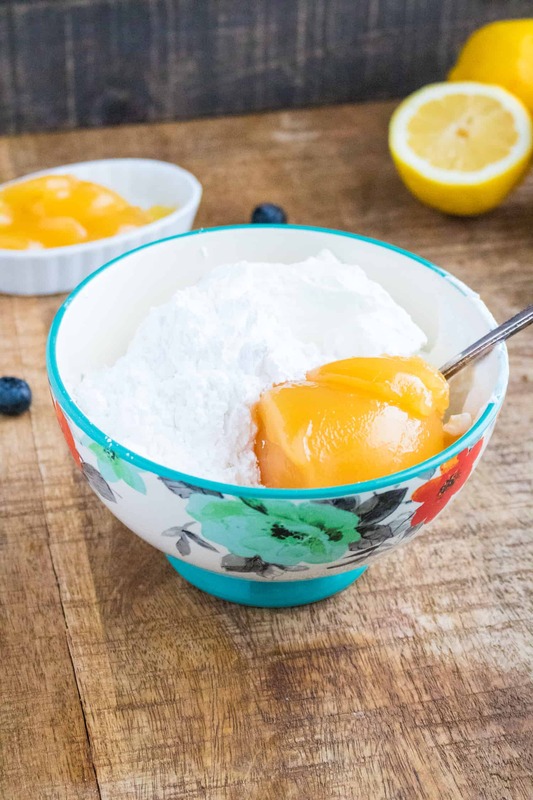 Fold in powdered sugar and lemon curd until well combined. Unroll cake and spread the lemon cream filling over the cake. Add blueberries over the top of the filling. Sift powdered sugar over the top of the cake to garnish. 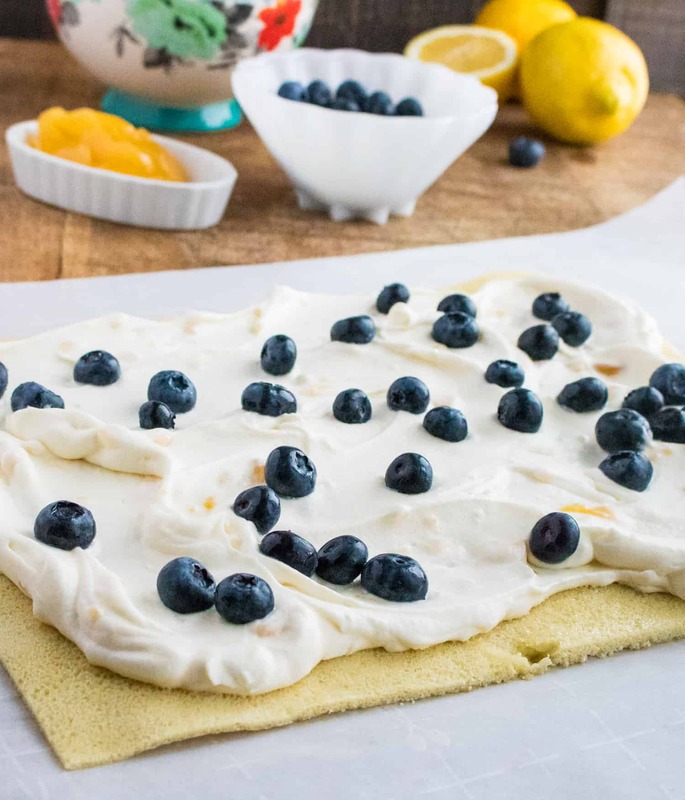 Add blueberries to the top if desired.